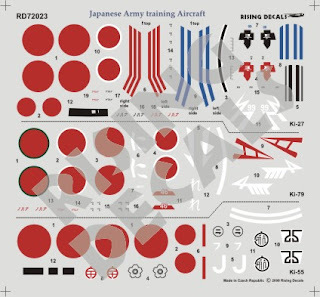 Another surprise issue from Rising is a set of 1/72nd scale decals for Japanese Army training aircraft. This includes markings for the Ki-27 'Nate' (Type 97 Fighter ~ 97 Shiki Sentoh-ki or 97-sen), the Ki-79 (Manshu built adaptation of the Ki-27 as a dedicated trainer) and the Ki-55 (Type 99 Advanced Trainer ~ 99 Shiki Kohtoh Renshuh-ki or 99 Koh-ren). 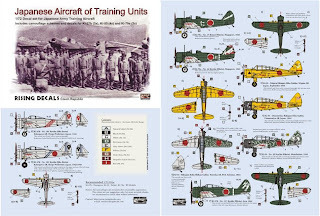 There is a selection of unit markings and one set of Hinomaru for each aircraft type. Particularly welcome are the complex markings for two different Ki-27 aircraft of the 101st Kyoiku Hiko Rentai, a Ki-27 of the 117th Kyoiku Hikotai based in Java and two Ki-79 Ko of the 17th Rensei Hikotai and 44th Kyoiku Hikotai based at Singapore, the latter with the unit tail marking superimposed on the marking of a previous unit. There is also an interesting all-yellow Ki-55 from the Niigata Army Flying School which does not have the black or dark brown cowling and undercarriage fairings usually associated with this type. This aircraft sports the civil registration 'J' on the tail. The Ki-27 is available as the veteran Hasegawa (ex-Mania kit), or more recently from RS Models (at first as a mixed media with vacform canopy - now available with injection molded canopy but quite an expensive option) and ICM, the latter kit being superb. Note: Rising have advised that the decals were designed for the Hasegawa kit as the wing and tail profiles of the RS Models kit are different - therefore decals may not fit the RS Models Ki-27. The Ki-79 is also available from RS Models. I have always been puzzled that Hasegawa never adapted their Ki-27 to provide for this version as a separate mainstream kit. It wouldn't take much and it is such a charismatic type. The Ki-55 is available from Fujimi and is another excellent kit. Painting instructions are very clear with references cited and it good to see Rising depict the correct yellow rather than the hideous and incorrect red-orange beloved of some modellers. All in all a most welcome opportunity to complete Japanese Army trainers in unusual schemes and highly recommended. Thanks for your comments on the new Rising Decals sheets and the old Airfix Dinah kit. Rising makes some great decals, I have their Myrt and "captured" Allied aircraft sheets which are of a very high quality. There used to be a vacform 1/48th Ki-36 from Gull Models but I think it is rare and difficult to find now. My comment re the potential for a Ki-79 conversion set or special edition applies even more so to Hasegawa's 1/48th ex-Mania Ki-27. It would be such an obvious enhancement to this kit. I have explored the idea of having such sets made privately for limited sale through this blogsite but most of the people doing resin don't seem interested. Thanks again for the feedback from both of you - it is much appreciated.